2015 Frankfurt Motor Show just opened. Some new cars and concept cars that we’ve been waiting for finally revealed in the auto show. 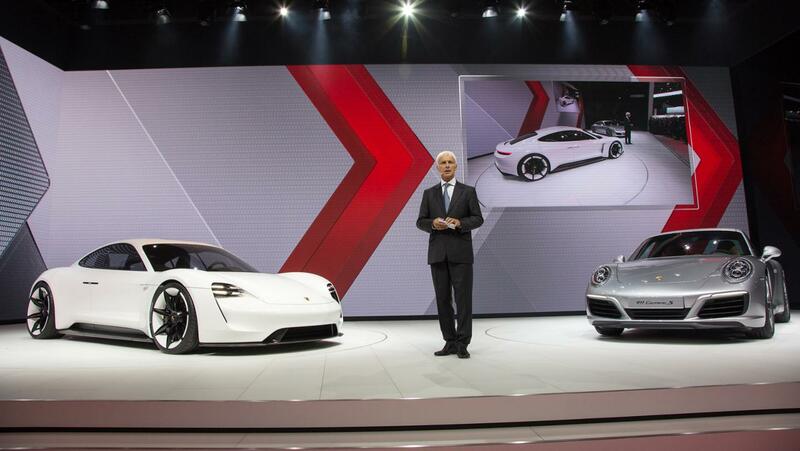 Audi and Porsche introduced new concept cars that will head-to-head with Tesla. Yes, the concept cars are electric-powered and also it previews the upcoming production cars from both of the automakers. 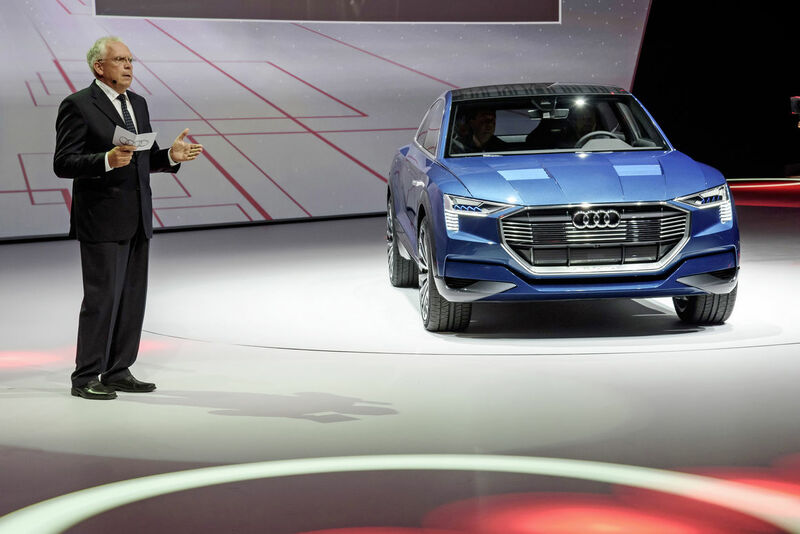 After releasing some sketches, Audi shows E-Tron Quattro Concept off at 2015 Frankfurt Auto Show. As I mention above, the crossover concept hints the-coming-soon Q6 which will be launched in early 2018. So, the exterior styling probably look like this with some changes in some parts to make it better. At the front, the sharp and sleek headlights bring Matrix laser, while below section there are OLED lights technology that debuts on the concept car. Another new technology is a solar roof that will put a little bit of energy to the battery. The Audi’s typical trapezoidal grille comes up with chromed horizontal lines. At the rear, E-Tron Quattro has the same OLED technology for its taillights. 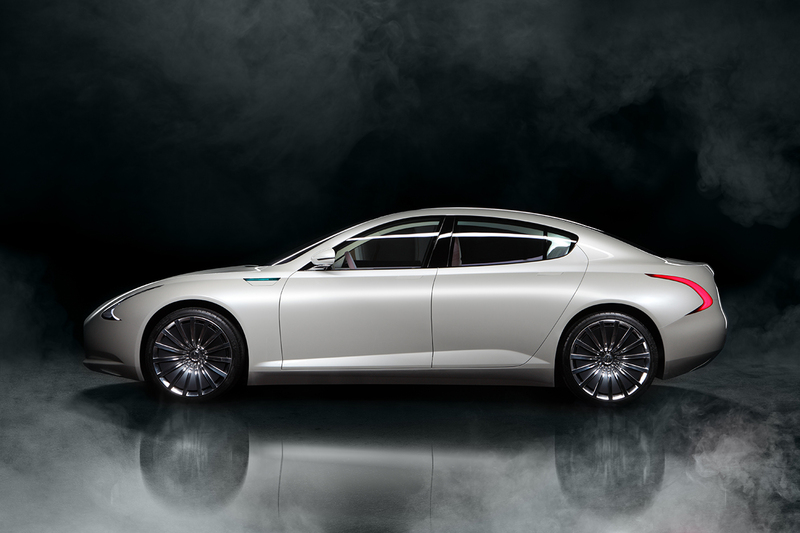 Clean, simple, sleek and roomy probably are the right words to describe the interior of the concept car. Say goodbye to the complicated buttons on the center cockpit. Audi replaces it all with touch screens which has OLED technology. Just like Audi’s latest cars, the E-Tron Quattro comes up with virtual cockpit display that will inform the driver about map, battery status, range driving, and even music that is playing. At least but not least, the crossover concept has 615 liters of luggage. The car with drag coefficient of 0.25 has 95 kWh battery capacity and 3 electric motors that drives front axle (1 unit), and rear axle (2 units). Total output is 429 hp, but while boosting it can produce 496 hp for short periods. Furthermore, it has 800 Nm of torque and its performance from 0 km/h to 100 km/h is 4.6 seconds. Meanwhile, its top speed is electronically-limited up to 210 km/h and its driving range is 500 km. The battery can be charged using current DC electrical with 150 kW output and it takes around 50 minutes until it’s fully-loaded. The concept study also brings autonomous driving technology which is equipped with radar sensors, a video camera, ultrasonic sensors, a laser scanner, and central driver assistance controller (zFAS). Audi claims that the technology is nearly ready for production cars. 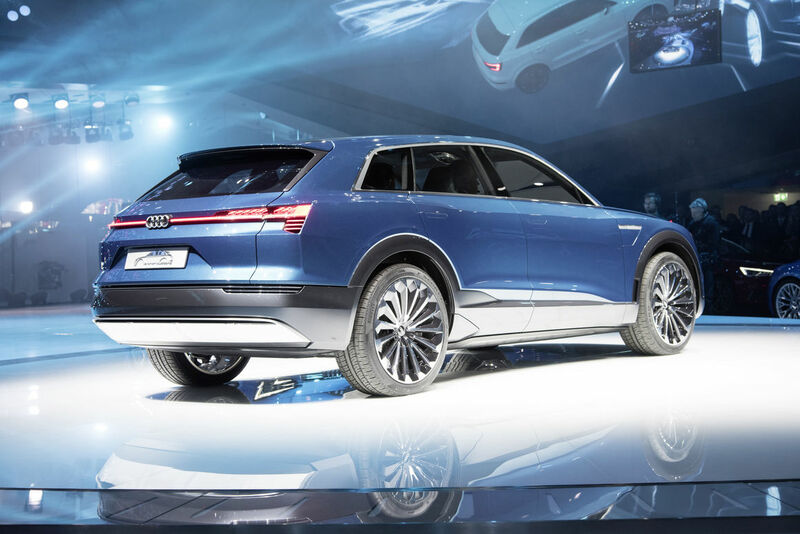 I expect to see it in next-gen Audi A8. 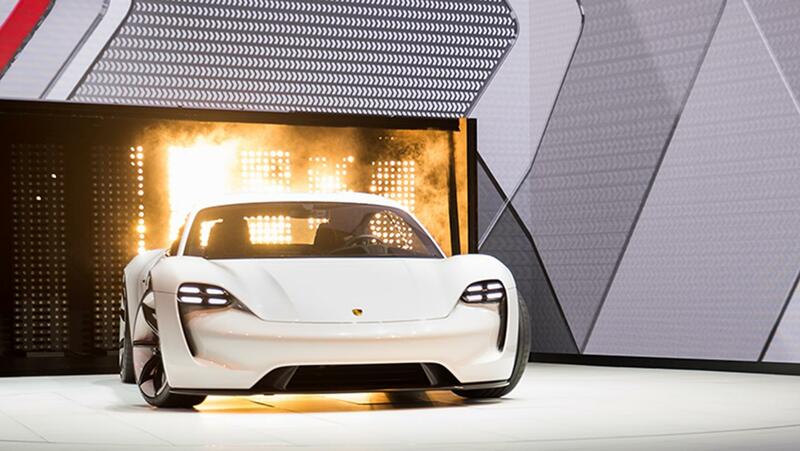 The rumor that was reported that Porsche wants to build an all-electric car to beat Tesla is completely true. At the 2015 Frankfurt Motor Show, the German automaker unveiled its latest concept car, Mission E. It’s not a two-door sport coupe like 911, but it’s a four-door sport sedan. Indirectly, it might preview the next generation of Panamera or even Panamera junior. Porsche’s designers give the Mission E a fresh exterior design.No more rounded headlights at the front. It is replaced by four headlights with laser Matrix technology that is adopted from Audi. The concept car has suicide door and it means that Mission E doesn’t have B-pillar. Meanwhile at the rear, Porsche said that it had typical sport car architecture. At this part, we can see LED taillights that sweeps away from left to the right. A three dimensional ‘PORSCHE’ badge makes Mission E looked more interesting. 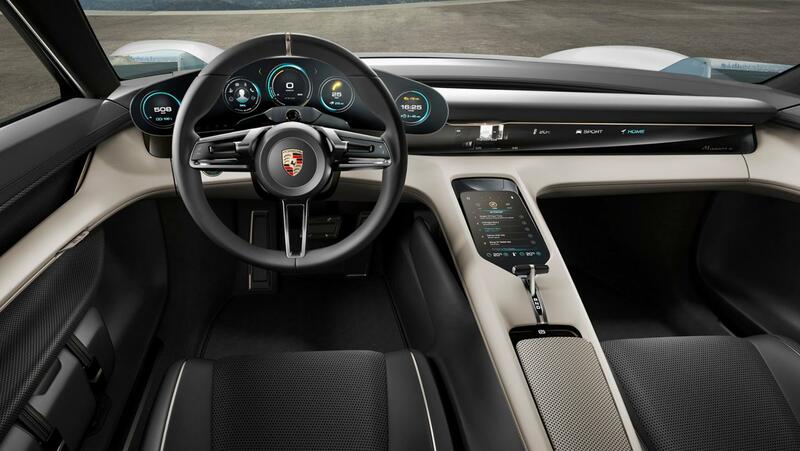 Inside, Porsche shows a futuristic interior styling. Just like, E-Tron cabin there are no buttons anymore and replaced with touchscreen displays using OLED technology. There are two layers 3D display. The first layer is driver’s display and the second is a holographic display that places from center cockpit to front-passenger side. The second layer displays media, navigation, climate control, contacts, and vehicles. Interestingly, the concept car features instrument that can be operated by eye-tracking, gesture control, and even hologram. And the 3-spoke steering wheel feels classic in a good way when I see it for the first time. 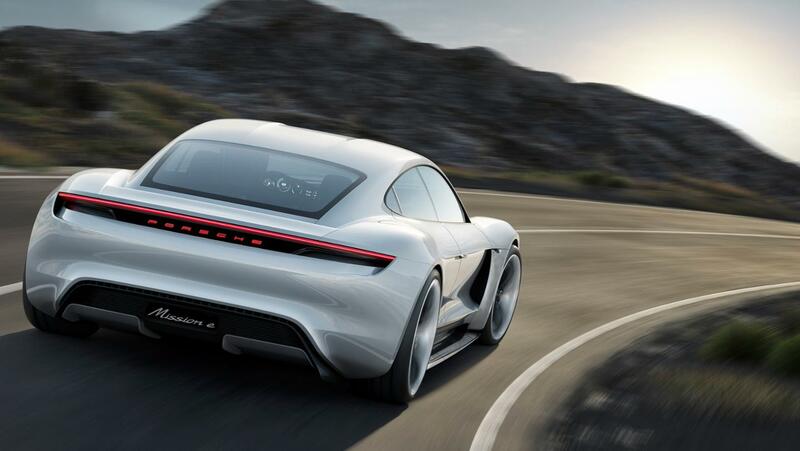 Porsche Mission E uses two PSMSs (Permanent Magnet Synchronous Motors) which can produce total output 600 hp and its driving range up to 500 km. The car with all-wheel-drive and all-wheel-steering system can reach 100 km/h from zero under 3.5 seconds. Furthermore, it can reach 200 km/h less than 12 seconds! The most impressive thing about this car is charging time. It can reach 80% only in 15 minutes, thanks to the first ever 800-volt drive system in the car’s industry. From German, let’s move to Asia. No, I don’t mean Japan, South Korea, or even China. I mean Taiwan. 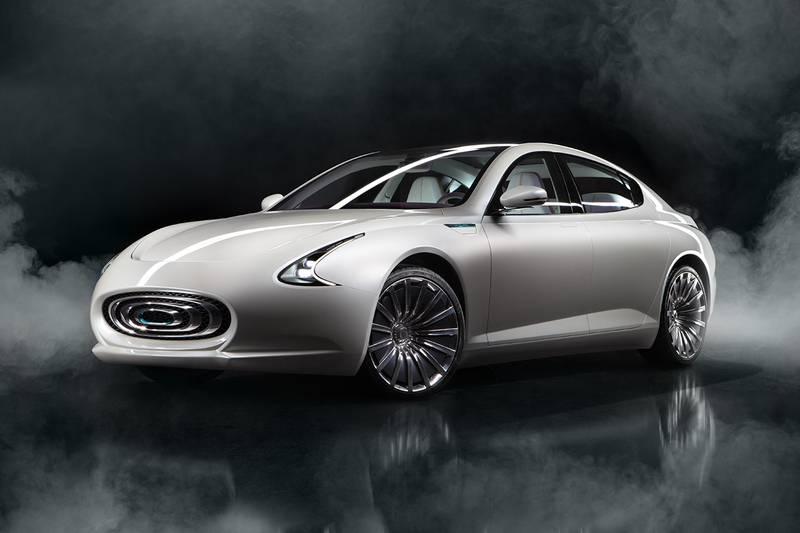 At 2015 Frankfurt Motor Show, Taiwanese automaker, Thunder Power introduced EV Concept to the world. It’s 4-door sedan that wants to beat Tesla Model S. The company plans to launch its product in Europe in 2017 and in China in 2018. The EV Concept is designed by Italian designer, Zagato. The exterior design is unique. Yeah, I said that it was ugly when I saw it for the first time. But I saw it for awhile and it’s not that ugly or even weird (at least it has own design). Up front, we can see boomerang-shaped headlights and chromed-rounded grille. At the rear, there’s the same shape taillights like the headlights. How about its performance? Thunder Power offers two electric powers, 308 hp and 429 hp. The more horsepower version can reach 100 km/h from zero in under 5 seconds and it’s claimed that its top speed is up to 155 miles per hour. Its driving range is more than 600 km, thanks to 125 kWh battery that is placed in the floor which is is based on unique high-energy-density lithium-ion cell technology.